Beauchamp Dental offers their patients almost 30 years of dental experience, with a primary focus on dental implants and cosmetic dentistry. As time has evolved, so has their office. They have updated their technology to include the latest and greatest in the dental field, such as the 3D iCAT machine which are only carried by a very small percentage of offices in South Florida. A change in the office also brought upon a change of their online presence, this is where we come in. 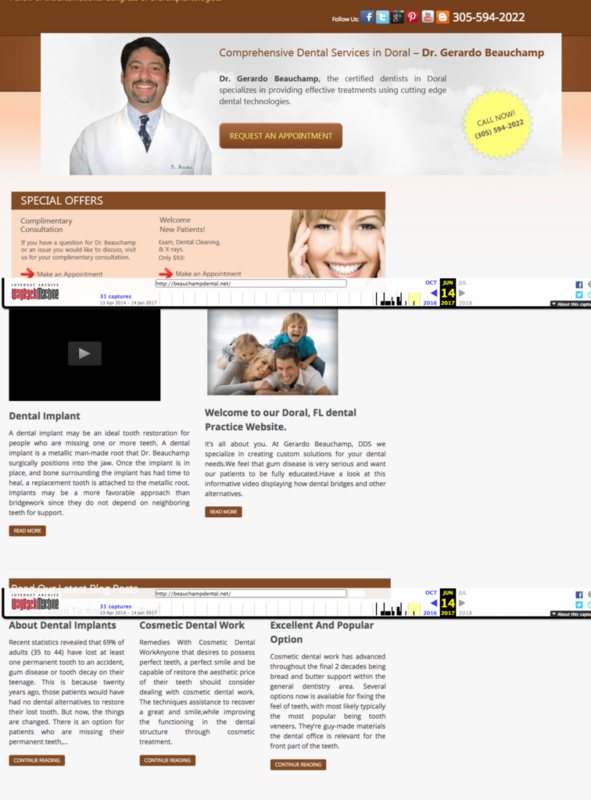 Beauchamp reached out to us for a website makeover. While their website provided some quality content information, they wanted to update their look to be more contemporary, inviting and lead generating. As you will see in the image above (a little distorted from screenshot) the primary colors chosen were not ideal for a dental office. Brown and tan are known as earthy, organic, wholesome colors which are great for coffee shops, chocolates, and even fashion brands but not dental. When you land on dental website you want something bright, vibrant, clean and inviting – this means using different shades of blues, whites, grey, green and so forth. This is exactly what we did for them. ** Logo designed but a wonderful designer not associated with Clicc Media Inc.